SAN DIEGO -- Draw a map of the countries represented on the World Team at the All-Star Futures Game, and you'll find that of the 11 nations and territories represented only two are entirely north of the Tropic of Cancer. And those two are very far north indeed. "I'm the only one representing my country. Not even here, but overall, in the Minor Leagues," said Pirates prospect Dovydas Neverauskas, whose brown and gold jersey bears a Lithuanian flag above the heart. "It's awesome." Fourth-ranked Mariners prospect Tyler O'Neill has represented his native Canada before -- most notably on the 2013 World Baseball Cup's 18U team -- and he was thrilled to suit up at Petco Park for a game telecast on MLB Network. "Every time I can wear the maple leaf, I'm always wearing it with pride, so I just want to go out there and represent them well," the native of British Columbia said. He was happy to see a familiar face among his World teammates -- fellow Canadian and No. 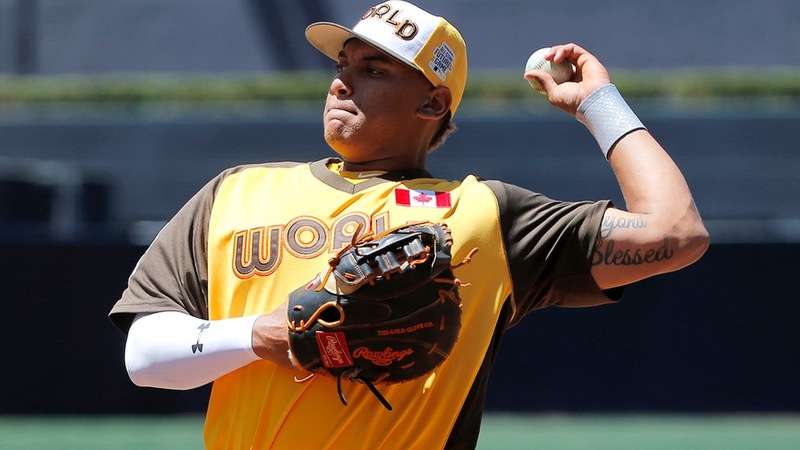 2 Marlins prospect Josh Naylor played on the same U18 squad in 2013 and their families met and became friends during a Power Showcase event in 2012. They've been pals ever since. "I texted him when I saw his name on the list. I'm like, 'Man, I can't wait to see you,' and he was excited to see me, too," Naylor said. "His family and my family are good friends, and it was a good time seeing them all." O'Neill and Naylor both profile as power hitters, and the Seattle prospect has lived up to that billing. He led the California League with 32 homers last year and has belted 16 in 80 games this season for Double-A Jackson. "Obviously, the ball doesn't carry as well [in the Southern League]," O'Neill said. "In a sense, it's kind of helped me to stay in my own head and keep hitting line drives and hard-hit balls, not necessarily fly balls that will get taken into the wind and land 50 feet over the fence. I'm just really trying to boost my average a little bit and let the power take care of itself because I know it will." Naylor, who homered once in 25 Rookie-level Gulf Coast Leagues last year and has left the yard nine times in 74 South Atlantic League games this season, admitted his power numbers have been a bit "lacking." "Yeah, a lot," he said. "I'm missing a lot of pitches. I'm trying to hard. I've been trying hard to impress people and trying to move up way too quickly." Neverauskas knows something about moving up quickly. The 23-year-old right-hander has worked exclusively out of the bullpen since debuting in pro ball in 2010, which was the first year he focused on the sport year-round. He started last season in the South Atlantic League, finished it with Class A Advanced Bradenton in the Florida State League, then opened 2016 in the Double-A Eastern League. Neverauskas was promoted to Triple-A Indianapolis last month and is 1-1 with a 1.86 ERA in 10 International League appearances. Among the many adjustments he's had to make since signing with the Pirates as a 16-year-old in 2009 has been getting used to much warmer weather. "Florida, especially. Indy got pretty humid the last couple days. I don't really like the humidity," he said. "The night games, it's OK. Day games is the worst. I'm not really a big fan of the day games." Neverauskas started playing baseball when he was 6, introduced to the game by his father, Virmidas, who was part of Lithuania's first baseball club in the 1980s and was the head coach for Vilnius Baseball Club and the Lithuanian U14, U16 and U18 international teams. Nobody could throw as hard as Neverauskas could at a young age, but breaking into pro ball posed a challenging transition. "Back home, nobody can hit, like, 90, 85. You don't have to throw 100 percent. It was boring [to be so dominant], but at the same time, it was a game, so you were trying to win," he said. "It was hard coming to the pros. You see guys who can actually hit 90-couple miles [per hour], or whatever it is. They actually can hit your fastball, so it was like, 'OK, it's not going to be just I'm going to throw fastballs and you're going to miss.' I gave up some bombs, too." Neverauskas said he hopes his Futures Game appearance can bring more young Lithuanians into baseball, possibly under his father's tutelage. "Of course," he said. "Hopefully, if I make it to the big leagues, kids go in to baseball practice retreats and we might be getting actually coaches from the Major Leagues, maybe come in to work with them for a month, to work with kids, give them more skills." As things stand now, he's hardly a national celebrity. He remains unrecognized on the streets of his native Vilnius, the Lithuanian capital. "My friends know why I am [in the States all summer]," he said. "But I'm not that guy yet. I hopefully won't be. I'm not really a big attention guy."